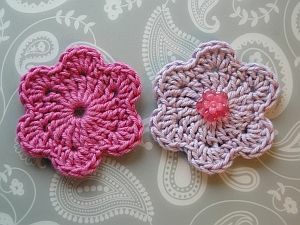 These flowers were crocheted with Lion Brand Bonbons sports weight cotton and a 3 mm hook. They measure 2 inches/5 cm across. We begin with a magic ring - my page about working it is here. If sewing on a button, use one of your tail ends to attach it before weaving in. Round 1: Make a magic ring. Round 2: 1 sc into next st, 5 dc into next. Tie off gently and weave this end from front to back through the back loop of your 1st sc of this round. Now weave in both ends neatly. Round 2: 1 dc into next st, 5 tr into next. Tie off gently and weave this end from front to back through the back loop of your 1st dc of this round. Want to add an extra flower? OK! 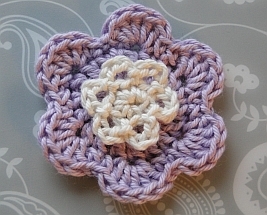 Another 6 petal crochet flower I've designed is Anne's Fleurette. She sits rather nicely in the middle, I think! You can add a button to this, too.